John Deere LX188 New Complete Hood Assembly AM132526 AM117724 M110378. You are looking at a brand new in the box complete hood assembly. It fits the following model: LX188. Part numbers included in sale are, AM132526 upper hood, AM117724 lower hood, M110378 Grille, M116096 lens, M116097 lens, M113384 pad, AM123485 wiring harness, M110441 medallion, AM128497 socket with bulbs x2, M127432 adapter ring x2, M111442 screw x8, JD5665 medallion, M117986 bumper, M116262 label, m116263 label. If there are any questions please send us your 13 digit serial number. We reserve the right to cancel the sale of any item to anyone who is not the end user of the product. We are a John Deere, Honda, Toro, MTD, Sears Craftsman, Echo, Oregon, Lawnboy, Briggs & Stratton, and Kohler dealer. 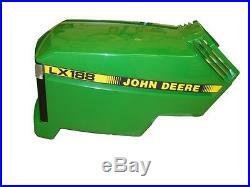 The item “John Deere LX188 New Complete Hood Assembly AM132526 AM117724 M110378″ is in sale since Friday, June 2, 2017. This item is in the category “Home & Garden\Yard, Garden & Outdoor Living\Lawn Mowers\Lawn Mower Parts & Accessories”. The seller is “bombergersjd” and is located in Lititz, Pennsylvania. This item can be shipped to United States.